I got a “prototype system” up and running for a media center solution using my new Windows Home Server as the storage for the video. I set up a new shared folder called “DVD” on the home server and fixed it so it’s not using file duplication (no need eating up double the amount of space for each movie), then ripped a disc to it. My laptop is running Vista Ultimate, so I set up the DVD Library to automatically watch for movies in the DVD shared folder and enabled it to play VIDEO_TS folder structures following the instructions here. Doing this worked perfectly and it played the ripped disc as though I had put it into the local drive. Exactly what I was looking for. It even played without glitches over the wireless network, which was surprising, but very cool. The next step is to figure out how I want to deal with the media center itself. I know I’m going to need some sort of dedicated machine, so that will probably end up being a Mac Mini, similar to the “death of DVD” story I was reading. The question is, what software do I want to run? The out-of-the-box DVD Library, which is the simplest way to go but doesn’t offer much in the way of searching/sorting by genre, cast, etc. My Movies, a plugin for Media Center, which provides a much richer interface but also is higher-touch. There’s a server component I’d have to install on the Windows Home Server that, frankly, scares me because the WHS is working so well right now, I’d hate to start hacking on it. Matinee, which looks pretty thin. I’m thinking if Front Row supports VIDEO_TS, I’d probably be best off with that over Matinee. DistantDVD, which is also pretty thin but is specifically geared towards what I’m trying to do - play the video off the network. It doesn’t show any more info than the DVD Library, though, so, again, if Front Row supports VIDEO_TS over the network, that might be the way to go. There are technically a lot of other choices for both platforms, but I’ve ruled out non-Windows-Media-Center choices for the Windows platform because I really don’t need most of the options the other servers offer and I don’t want to hassle with a lot of extra configuration and hackery. I didn’t list any different platforms for the Mac because, frankly, I’m ignorant. I’m really hoping to keep it simple, though, so as much out-of-the-box, it-just-works as I can get, the better. Do I need to have cast/genre/etc. information with the movies or is the title and cover art enough? If I need more than title/cover art, My Movies seems to be the way. If I don’t need more than title/cover art… Do I want to use out-of-the-box Mac stuff or do I want Vista Media Center? If it’s OOTB Mac, which would be the easiest, it looks like Front Row is probably the answer. If it’s Vista Media Center, DVD Library. Yesterday the entire Voyager User Solutions and Infrastructure teams went downtown Portland to do a photo scavenger hunt. We were broken up into three teams - Red, Yellow, and Blue, and ran around taking pictures of ourselves with various landmarks. 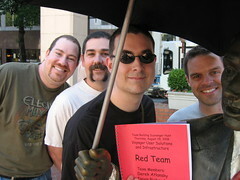 Jeff, Derek, I, and Devin were on the Red Team. We started out at Pioneer Place around noon for lunch, then at 1:00p met up in Pioneer Courthouse Square to get our clue packets and get moving. From then until about 3:30p we went everywhere from Powell’s Books to Skidmore Fountain to the Portland Art Museum and the Oregon Historical Society getting pictures. After an extremely exhausting day, all of the teams reconvened at the Pinocchio Bar and Restaurant for happy hour and dinner. A great time was had by all. We learned a few things about Portland that we didn’t know (and I’ve lived here my entire life!) and came out all the better for it. Maybe next time we’ll go skydiving…. nah. 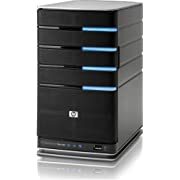 After pondering various options for media center related storage, Jenn and I happened to be walking through Fry’s this weekend and saw they had dropped prices on HP MediaSmart Servers quite a bit so we bit the bullet and got the 1TB model. So far, I like it quite a bit. The form factor really surprised me. It’s small. Like, so small we walked right past it in the store and didn’t even notice it. We ended up asking where they were and when we saw it we were surprised by the size. I expected a mini-tower; it’s really only about nine inches tall and five inches wide. The whole package is fairly aesthetically pleasing so if you don’t have a desk to put it under, it’s not going to look bad sitting in plain sight. Actually, the level of configuration reminded me of a game console. Like when you set up your Xbox 360 or Playstation 3 on the network and configure one or two things - you don’t have to deal with verifying the drivers are set up right, or tweaking the registry to get it to perform, or running command-line programs to register or configure things… it just works. It will even configure your router for you through UPnP if you want to expose your server on the internet so you can get to your media remotely. I’d never seen that before and I wonder why it’s not available in things like the Xbox 360, which requires certain ports to be open to connect to Xbox Live. The only real complaint I have, if you could call it that, is that it’s so high-level that it doesn’t really reveal what some of the functionality is doing behind the scenes. For example, there’s an iTunes sharing function on it that I’d love to use instead of my multi-user iTunes hack, but I’m not sure how it works so I’m reluctant to start moving things around onto the server before I understand what it’s doing… but there’s nothing in the docs to explain what’s going on beyond explaining how to configure it. Regardless, this solves my media storage problem, so at the very least I can start ripping DVDs in VIDEO_TS format and saving them here. My laptop has Vista Ultimate on it, and I have another license for it that I can put on my Windows XP desktop (once I’ve migrated the shared data off there - it’s my “file server” right now), so I can try out My Movies on one of those and see how it goes. Two things happened this weekend from an entertainment perspective. Second, Jenn and I went with my parents to see Tropic Thunder. It was funny, to be sure, but I’m not sure which was funnier: the movie, or watching my dad nearly fall out of his seat laughing at the movie. There was definitely a lot of random stuff going on in there, and I went in not really knowing anything about it or what to expect, but it was worth the watch. Far and away, Tom Cruise was the greatest thing in that movie, though - so over the top. I still want to see Death Race, though. I was totally in the mood for mindless action but we ended up hitting Tropic Thunder instead. My craving for destruction has not yet been sated.